One of the fundamental things in a medieval book is letters – those symbols that fill up page after page and that make up meaning. Each one of us human beings writes differently and considering that medieval books were made before the invention of print, it follows that the scripts they carry show a great variety in execution styles. This is perhaps the most amazing experience of spending a day going through a pile of medieval books in the library: the immense variation in the manner in which the text is written on the parchment pages. No surviving artefact underscores this point of variation better than advertisement sheets of commercial scribes. The one in Fig. 1 was produced by Herman Strepel and through it he shows off his expertise – and in a sense his merchandise – to customers who visited his shop. The blank back shows that the sheet was hanging on the wall, like a menu in a fast-food restaurant. He even wrote the names of the scripts next to the samples, in appealing golden letters, like a good businessman (more about advertisements from the medieval book world in this post). In this wild party of letter shapes roughly two categories of variation can be observed: first, the shape of medieval letters differs because they belong to different script families; and secondly, their precise execution varies because the scribes opted for a particular size, thickness, quality, and pen angle. Remarkably, this variation is still preserved in our modern notions of typefaces, which represent the families, and fonts, which express the variation within these families, for example concerning size (for their meaning, see here). If we forget, for a moment, that letters themselves convey meaning, these two levels of variation – choice of script and of its execution – comprise perhaps the greatest value: letters show us when a manuscript was made. This information comes in extremely handy considering that the title page was not yet invented. But how do we find it? Welcome to the secretive world of handwritten letters from the Middle Ages. Medieval script tells time, although usually not very precisely. Take for example the three major script families from the medieval period: Caroline minuscule (Fig. 2, sample 1), Pregothic script (Fig. 2, sample 2), and Littera textualis or Gothic script (Fig. 2, sample 3). Despite the fact that these three families are relatively easy to distinguish and identify, they were used for extensive periods of time: Caroline (nr. 1) from c. 800 to c. 1050, Pregothic (nr. 2) from c. 1050 to c. 1250, and Gothic from c. 1250 to c. 1500. In other words, merely identifying the family of handwriting is not enough to pinpoint when precisely a book was made. To get that information one needs to do more – and this is where things start to get a bit more complicated. To know when a book was copied, one needs to investigate where in the timespan of a script the sample in question can be placed. Does a style of writing fit better in the early stages of a script, is it representative of the end of its life cycle, or perhaps rather somewhere in the middle age? To be able to answer this question one needs to know how the font in question developed over time. This is the kind of research I have been doing over the last few years, called quantitative paleography because it uses a high volume of verifiable data. Thus it is possible to map how Pregothic evolved by tracking,for example, the letter pair de (Fig. 3, magnifying glass). Fig. 3 – Letter pair “de” in Charleville, Bibliothèque municipale, Ms 246 B (dated 1156-1157). Here the two elements of this letter pair, which was written down in 1156 or 1157, are touching one another, albeit only slightly. Just twenty years earlier these same letters would still have been written fully separated. This becomes clear when we gather data from manuscripts that bear a date (like the one in Fig. 3), which they do every now and then. When this data is gathered one can deduce, with statistical support, when certain features were born or when they died. Thus data shows, for example, that the touching of de is first encountered in the period 1150-1175. The process, which I dubbed “kissing” in this free downloadable book (which also shows how the method works), continues until the two letters fully overlap. This is called “biting” by script experts (Fig. 4, magnifying glass). In fact, the pair highlighted in Fig. 4 has moved so close together that they share the central vertical pen stroke: the right side of d is also the left side of e. The two have literally become inseparable, because separating them would leave one of them incomplete. The data – gathered from 342 dated manuscripts written between 1075 and 1225 – shows how biting emerged at different moments in different letter pairs: first in pp, then in de and do, and subsequently in some others. (Fig. 5). It shows how even a single script feature needed time to spread to all corners of the script. The average medieval scribe knew a number of scripts by heart. Commercial producers of books, discussed at the outset of this post, aimed to please a diverse clientele and will therefore likely have known more fonts than any other type of scribe, including the monk (Fig. 6). The latter was very conservative: he did not often have a broad palette of scripts and he was disinclined to adapt his manner of writing on command. Still, even within single scripts monks show variation in the style of execution. Interestingly, he poured into something from his cultural-historical background in the shape of letters, revealing to the attentive beholder when precisely he wrote a book, even when he did not give this piece of information away explicitly. How the letters were formed may also reveal other things about the scribe, for example where he or she lived, or even that it was a hasty book project. Unveiling this hidden information in handwriting is difficult, because letter shapes do not easily give up their secrets. Still, the increasing popularity of Digital Humanities and the tendency of modern script experts to map the development of handwriting with the help of verifiable data makes it increasingly more difficult for scribes to hide their secrets. Postscriptum – In response to some helpful remarks on Twitter, I am aware, of course, that scripts and fonts – as used in the title – are not the same thing. However, I like the comparison of the two, and used it here, because just like medieval script, a font relates both to the notion of family (Times New Roman) and its execution (e.g. a 12 point letter). More on fonts and typefaces here (via John Mulloy, @MulloyJohn). If you don’t know when something precisely happened, can you still call it a historical event? What is the historian to do with information from a source that is not dated? What if it mentions how an official was murdered, that he fell by the knife, and that his killer was a student? Details abound, but dateless the event is largely meaningless. Historical information floating in time remains ordinary: a murder is a murder, nothing more. For the disciplines that study the Middle Ages such undated sources are common. From circa 1500, at the close of the period, we have the luxury of knowing precisely when a source was produced. At that point in time, after all, such information was placed on the first – title – page of the book. How unlucky we medievalists are. We depend on thousands of handwritten sources that were made before the invention of the title page and which are, consequently, by and large undated. How are we to write the history of an age with so much “floating” information? This complex query has a seemingly simple answer: by learning how to date. In order to so, paleographers like myself study the shape of letters. There is something magical about handwritten letters that makes them irresistible to me. A medieval scribe who wrote information on parchment did so, like we do today, in his own, individual manner. When we receive a letter from a loved one we intuitively recognize his or her handwriting merely by glancing at it. The process takes a split-second and may occur from as much as a meter away. It shows that each individual embeds, subconsciously, personal traits into the letters that flow out of his or her pen. Beholders somehow pick up on these “signals” frozen in the shape of letters. A sentence written on parchment becomes a skyline that might be recognized from afar – because we have visited the city before. An experienced paleographer looking at medieval manuscripts thus recognizes a scribal hand: “Zap!” it goes in his head. Another “Zap!” moment arrives when the paleographer activates the part of his brain that intuitively tells him how old a specimen of writing is. Curiously, in this case it is not the individual traits that are important, but the generic ones. While handwriting with only unique characteristics is hard to date, one that conforms to contemporary trends is easier to place in time. Instinct and experience are crucial in this process: the experienced eye of the paleographer recognizes the script of an individual as exponent of a style of writing that is particular for a certain period – or geographical location, but that is another story. With such verdicts as “early thirteenth century” or “middle of the fourteenth century” information is secured in time. One of the most significant challenges for the discipline of paleography is to transform these intuitive verdicts into assessments that are objective and substantiated with quantifiable data. The physical shape of the letter is still the point of departure but it is given a different role to play. In my own work two processes are important in this respect: to describe the shape of a letter (or even an individual stroke) as precisely as possible; and subsequently measuring how the shape evolved over time. In my experience, the latter is best done with manuscripts that, by exception, do contain a date. They are usually written down by the scribe on the last page of the manuscript. From these dated books one can deduce how a given letter was constructed physically at a certain point in time – or even in a particular geographical location, if the scribe also tells us where he wrote the book. If the corpus of dated books is large enough and spans enough years, we may witness how a letter developed over time. When the script of an undated manuscript is subsequently placed alongside this reconstructed time line of script development, a likely date of production may emerge. Take the following example from the twelfth century, the period studied in our “Turning Over a New Leaf” project. Over the course of this century we notice how letter pairs with contrasting round strokes – like be or od– undergo a remarkable development. Blown up on a 29-inch screen it becomes clear that at the outset of the century the pairs are always separated: white space is clearly visible in between the individual parts that make up the pair. Halfway the century, however, we witness how the couples hesitatingly (but barely) start to touch one another, a process that is called “kissing”. Near the end of the century, finally, the pairs slightly overlap, a process known as “fusion” or “biting”. From distant strangers to couples in love: the stages of development turn out to be perfectly datable. Now the historian can do his thing. With an accurately dated source, information is given its rightful place in history, turning ordinary murder into historical event and adding to our understanding of the medieval period. Letter shapes thus calibrate our sense of dating. They anchor events in time so they can make history. Want to know more about script development in the twelfth century? Erik Kwakkel, “Kissing, Biting and the Treatment of Feet: The Transitional Script of the Long Twelfth Century,” in Erik Kwakkel, Rosamond McKitterick and Rodney Thomson, Turning Over a New Leaf: Change and Development in the Medieval Book (Leiden: Leiden University Press, 2012), 79-126. This week one of my MA-students expressed he wanted to write his thesis on MS VLQ 1 in the Leiden University Library. The manuscript in question contains an alphabetized version of Dioscorides’ De materia medica. It belonged to a copy presented in several parts, but the others have all been lost, it seems (VLQ 1 contains the Preface and Acorus through Ficus maritima). It was made in or nearby the Benedictine abbey of Monte Cassino in the late eleventh century. This monastery is known for its high-end illuminated manuscripts written in Beneventan script. Thumbing through VLQ 1, however, quickly shows that this is not such a book. Not a single decorative element is encountered in the manuscript and the parchment is of particularly poor quality: some folia contain pronounced follicle patterns, translucent patches or a yellow discoloration; others contain cuts or gaps at the edge of the page. The manuscript’s most notable feature, however, is the mix of scripts on its pages. The first scribe, who copied f. 1r to f. 13v, line 36, includes such familiar Beneventan letter forms as the a that looks like ac, the enlarged e that looks like a t with a circle on top, and the ti ligature. Curiously, the two remaining hands in the volume used Caroline Minuscule. 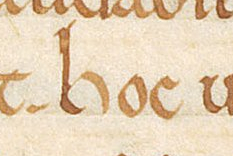 The first of these takes over in line 37 of f. 13v, halfway through a sentence (see image). The transition is marked by a “barred” capital “P” in the margin, contemporary and perhaps executed by the first hand. A third individual copied the remainder of the manuscript (f. 32v). The script suggests the first scribe was trained in the Beneventan zone (Monte Cassino and its surroundings); the others came from elsewhere. Monte-Cassino expert Francis Newton relates the coexistence and mixed application of Beneventan and Caroline in Southern-Italian scriptoria to status and the purpose of a book. High-quality manuscripts with gold and colored initials, which he calls Nobilissimi or most noble books, are always copied in Beneventan script. This category consists of display books and liturgical manuscripts. One step down in the hierarchy there are the Notabiliores, or more notable books, commonly with patristic and classical contents as well as contemporary medieval texts, predominantly written in Beneventan script entirely. The lowest tier on Newton’s ladder is a class he calls Viliores, or more common books. This is where we may situate VLQ 1. These manuscripts, which may be partly written in Beneventan and partly in Caroline, contain works on such topics as dialectic, grammar, law and medicine. These plain objects were likely made for school use or scholarly pursuit. Thus, the Leiden Dioscorides is common but not ordinary: the object holds an every-day text that was produced under unusual circumstances, in a scriptorium where scribes from different origins found common ground in the books they copied. I can’t wait to see what the MA-thesis will uncover about this most intriguing book. Talking about medieval manuscripts in front of a camera is really tough. This verdict shot through my head as I was taping podcasts in the Palaeography Room at the University of London’s School of Advanced Studies recently. The activity seems no different than demonstrating the beauty of the handwritten book to a group of students or an audience of lay people, something I can do with my eyes closed. You lift a manuscript out of the storage box and explain the significance of its features, as passionately as possible, while flipping pages. In actuality, however, the rolling camera brings unusual pressure to the event. It did not help that I had not seen the material in front of me before: the manuscripts and fragments had introduced themselves briefly to me only an hour before, while climbing out of their boxes and shaking off their envelopes in the curator’s office, relieved to be out in the open again. Yet while the items and I had had a pleasant conversation, I did not really know them. In fact, presenting them in front of a camera to a potentially very large online audience felt like introducing a complete stranger to a busy party. Who were they? Where did they come from? What made them tick? And why again had I invited them? As is often the case with public speaking, it is exactly this intellectual challenge of thinking on your feet and not exactly knowing what you will say next or how you will tie an observation to your train of thoughts, that makes it so much fun to do. And so I pressed on and taped 5-minute podcasts on the Paris Bible (‘Written in a letter of only 2 mm high, comparable to a modern newspaper!’), a student textbook (‘Not a single unabbreviated word on this page!’), manuscript fragments (‘Behold, hidden treasure in a bookbinding…’), layout (‘This scribe really knew what he was doing.’) and the transition from Caroline minuscule to Gothic script (‘Look at these two letters biting each other.’). What I have learned from the experience? You’ll be alright if you are able to forget the camera. You do better without judging what you say as you say it. And it helps to pick items that have pronounced features and that relate to the theme of a podcast in a clear manner. But most of all, that introducing strangers at a party can be a lot of fun. History SPOT published a blog entry describing the filming of these movies from the perspective of the camera man.